Amid attempts to stem the flow of migrants and refugees into Europe, Greek officials have hit back at proposals that would effectively block the country off from the rest of the EU, saying plans to implement border controls along Greece's northern border would create a "cemetery of souls" in the country. Following a meeting of EU ministers in Amsterdam, the European Commission threw its weight behind proposals that would alter the EU's passport-free travel zone, known as Schengen, to exclude Greece. The plans are aimed at trying to manage the flow of refugees and migrants entering the EU, with many arriving from the Middle East into Greece and then continuing their voyage through the Balkans and into central and northern Europe. A number of EU officials and other member states have been highly critical of Greece's handling of the influx of new arrivals into Europe, accusing the country of failing to set up adequate holding camps that have allowed thousands of unchecked new arrivals to travel further into the bloc. However, Greece's minister for migration Ioannis Mouzalas firmly rejected the proposals. "We do not intend to become a cemetery of souls here. We cannot understand what kind of policy it is that a country would close its borders with Greece […] We do not have time to experiment with things that will only worsen the trauma." Despite Greek protestations, the plans — initially tabled by Slovenian Prime Minister Miro Cerar — have gathered significant support among other EU member states. "If we cannot protect the external EU border, the Greek-Turkish border, then the Schengen external border will move towards central Europe," Austrian interior minister Johanna Mikl-Leitner said. "Greece must increase its resources as soon as possible and accept help." European Commission President Jean-Claude Juncker added further support to the proposals, saying he would "welcome" plans to send forces to Greece's northern border with Macedonia to help track and control the flow of people through the region. 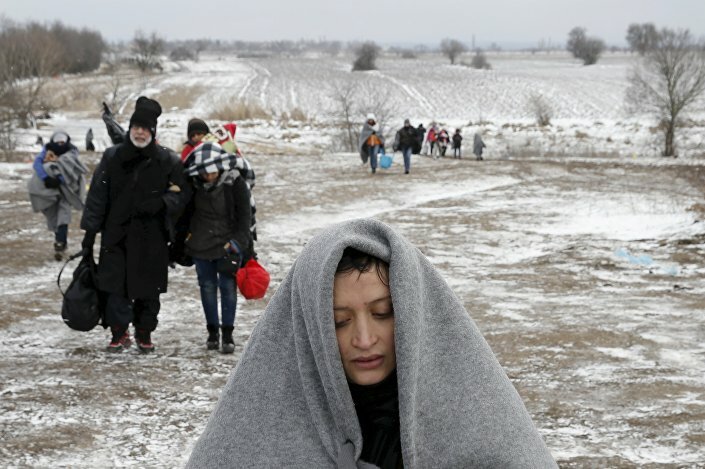 Migrants walk through a frozen field after crossing the border from Macedonia, near the village of Miratovac, Serbia, January 18, 2016. However, Greek officials fear such a plan to impose border controls would turn the country into a "black box" for refugees. "EU institutions making plans with countries like Fyrom [Macedonia], that are not member states, and then leaving actual member states out of this dialogue — this is not the way to reach a solution," Mr Mouzalas said.